That's a great idea for all markers! How creative! What a great storage solution! Thanks so much for sharing! AWESOME idea...love your storage solution! 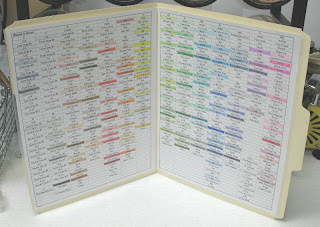 I would LOVE to have a copy of your marker document to see how you organized your chart! I am getting a set of copics in the future...and am VERY excited to use them! wow this is awesome!! I love your storage solution and your copic chart. Fantastic idea I may have to use it. Maureen, what a great way to store your copics! I don't have near that many (yet! ), but that idea is just fantastic! I absolutely LOVE your storage idea as well as the manilla folder idea. You can bet that I will be using both of these for my Copics! Thank you so much for sharing! Great thinking! I'm so jealous! I may have to use some of my birthday money and make a trip to Pier 1. I love that store - you can really find cool things there and re-purpose them to fit your needs. Thanks for sharing! I love this ! Awesome storage idea which I am going to copy and great idea for your charts, which I am going to copy as well. Thanks for sharing. Oh I freakin' love this idea. I need that. Right now. It's perfect! I hate how I have mine now but haven't figured out what to do yet. Since the move is in a couple weeks I have time to find myself one of those racks. Pier 1 rules! Fantastic idea!!! I love it!! Wow, I have almost the same thing on my desk, but use some stacking bins I bought at the dollar store and then put the cups in there, and just stacked them up! It really is nice and easy to grab the markers when they are stored this way, easy to see, easy to grab and easy to put back. I love the way your store your markers! I love this! I want to use it in my preschool classroom and already picked up a wine rack from Goodwill. Where did you get the tumblers from? i am doing a series on my blog about unique craft spaces/ideas and would love for you to link this up! OMG you solved a huge problem for me! I have the very same 3 tiered wine rack that I bought for under $10 at a thrift store only to figure out that I don't drink wine much and if I did I wouldn't ever have that much of it on reserve. I have been trying to figure out what to do with it...almost gave it away. I didn't even think to put something like a cup in it for storage. I might even use some pvc pipe or something along that line too. I am so excited!!! Thanks! LOVE THIS!! Now I just need to finish organizing my space so I have somewhere to put this... thank you! LOVE this idea, much better than those boxes that you have to put each marker in it's little slot. You could probably even get glasses with lids so if you wanted to take your markers with you all you have to do is put the lids on the glasses and they wouldn't spill out while traveling! Thanks for the BRILLIANT idea!! LOVE this idea. Much better than those Copic boxes where you have to put each marker in it's own little slot. You could probably even get cups that have lids so if you wanted to take your markers to a class all you would have to do is put the lids on the glasses to keep them from spilling out while traveling! I just found this from Pinterest!! This would be a great way for me to store coloring supplies in my classroom! And I love all your colorful markers! I WANT THIS! :) Im going to be a first year teacher this year and trying to find ways to store my markers and other things, this is a great idea! 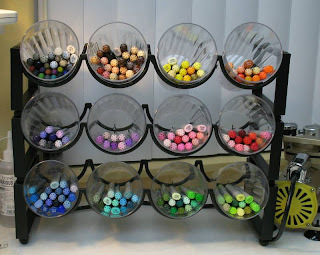 I've been looking for a way to store my markers...I love this idea! How creative! How much was the wine rack? I am a new follower and think I will really enjoy your blog! Great idea! I got to make myself one of those! I love the idea. I have the wine racks but am having a hard time finding glasses to fit. Do your glasses fit completely or do the go close to the back and then tied? Seriously? Wow! That's really creative and they make a colorful storage space. I'm not sure what alternative you can use for the office though. But I want this! I actually own that wine rack and was about to throw it out because I don't drink. Now I will suggest this to my artist daughter! That is awesome. I linked back here from Pinterest. I have seen so many crappy solutions to the copic marker storage issue, but this one rocks! Both ideas are great! I think I will give them a try. Thanks for the inspiration. Wow nifty..I searched high and low and ended up with commercial holder that was cheap and effective, but they all are kinda pricey, or bulky! You are VERY creative. Wow! I am thinking of getting one for the vanity in my dressing area. Awesome storage idea. I just replicated it in my photography studio in my fashion illustration area. I wish I could post a photo to show everyone. Thanks so much for sharing this fabulous solution for storing our markers.